Welcome to the inaugural "Tales From The Gimmick Tables". 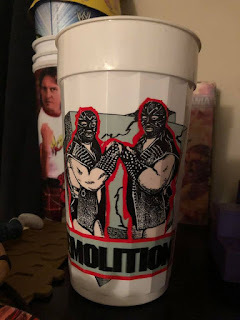 A running series of articles where I look at random wrestling merchandise through the years that either hold sentimental value or could be some of the lamest stuff I've seen in all my time of being a fan. Today though, is a most excellent piece of memorabilia! When it comes to collecting things, there are some items you search way too long for and some items, you spend way too much on. This is one of those items that fall into both categories. 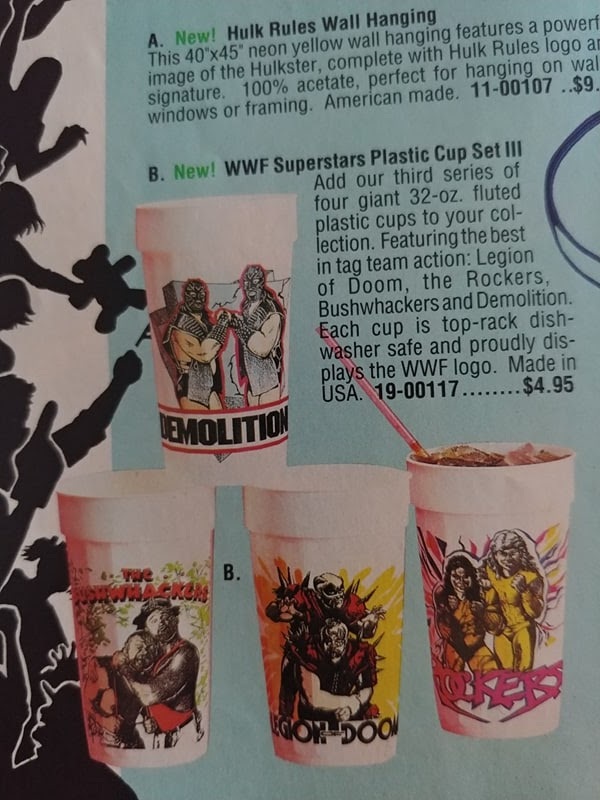 Back in 1991, WWF released their third set of collector cups featuring the best tag teams in the company at the time. In a huge upset, it seems Power and Glory were shoved out for the Bushwackers, but who am I to judge? 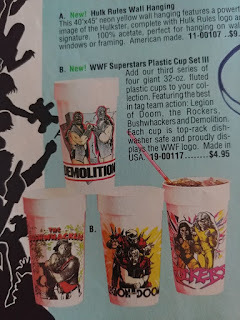 These cups were pretty spectacular and ONLY available in the merchandise catalog or at the live events. In essence, if you owned something from these legendary catalogs, you pretty much belonged to an exclusive group. There was no store this fun merch was available in. It was only meant for the most ardent fan to show off and brag over. 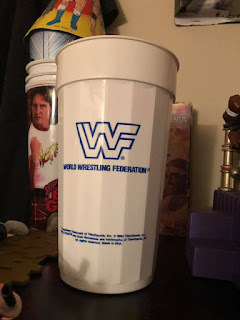 The kids on the playground would be downright envious of your Ted Dibiase coin bank or your Dusty Rhodes ringer shirt. But these cups? These'll impress everyone who stops by to visit. Of course, I wasn't destined to be one of the kids who did own these in 1991 because my mom didn't wanna buy them but I wouldn't give up on owning one. One day I'd own one. As beautiful as they look, I can't imagine they were super popular. In fact, I hadn't even seen these or the previous releases on eBay or in wrestling memorabilia groups. It seemed they had all gone forgotten. Except me. 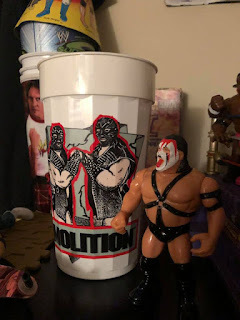 For years, even decades, I had never forgotten these and had driven myself crazy searching for the Demolition cup itself since they were my all time fave tag team and yes that still stands. No offense to The Beverly Brothers of course. 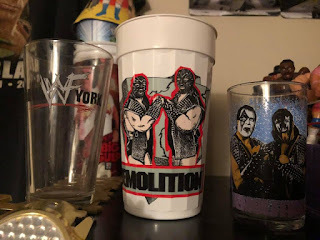 The problem became, if I found one of the cups in this set, it would be way too expensive, someone wasn't willing to split up the set itself or it would be faded beyond recognition. After a while, I was convinced I would never find it. As a lifelong cup collector, it drove me insane that I'd have to abandon my journey. Until last month that is! My buddy had gotten the entire set and was willing to let Demolition go, knowing how long I had searched for it. After all these years, it would finally be mine. Holy crap! Check that out! I was under the impression it was in great shape, but didn't expect this! It's almost like whoever owned it, just ordered it, left it in the cupboard and forgot about it. No cracks, no stains, absolutely perfect. Even if Crush is included in the picture. I would've preferred Ax but let's not go down that road. 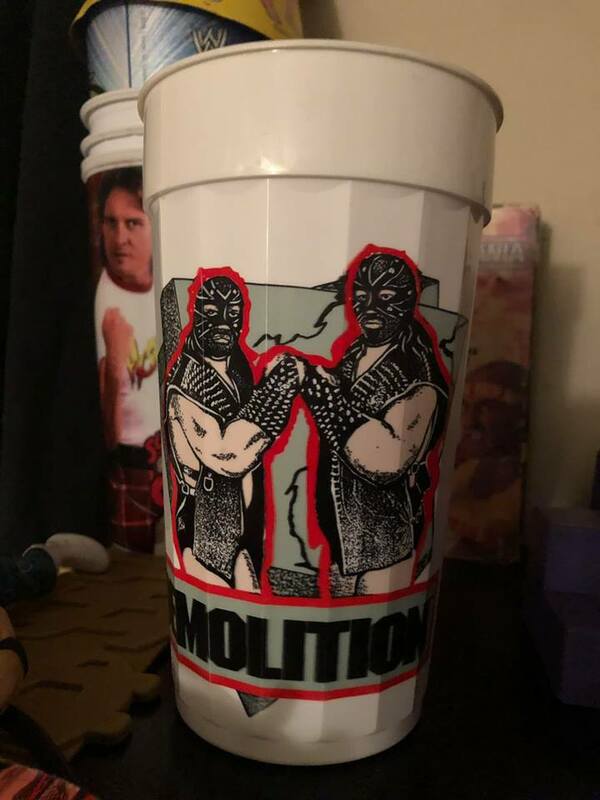 What impresses me most about this cup is that this is one of the very few, if not only, pieces of merchandise that featured Demolition wearing their short lived wrestling masks as featured on the road to Survivor Series 1990 where they joined forces with Mr. Perfect to battle against Legion Of Doom, Ultimate Warrior and Texas Tornado. The masks were unique but clever as they could play tricks in the ring and swap out a tired man for a fresher competitor whenever they saw the odds against their favor. The ref would never be the wiser. If you ever notice, the majority of Demo's merchandising usually depicts them in their makeup and focuses on their unusual face paint patterns so to see something with their faces obscured by their bizarre wrestling masks that they only wore for a very brief amount of time, is pretty unique and remains a reminder of this brief gimmick for the team. The masks were eliminated shortly after they debuted and went forgotten and they went back to using their awesome and intimidating facepaint. Wow it's big! Keep in mind, Smash figure is 5 inches tall, so this is almost twice the size! I always pictured them to be the size of smaller promo cups you'd see given out at job fairs or summer concerts. But this is the big time. This is the WWF. They never did things on a small scale. Unless you count when they filmed Monday Night Raw in high school gyms in 1995. Totally a sweet throwback! Check out that sweet block logo! I feel like this is the kind of cup I'd use to drink Ecto Cooler out of while floating around my sister Erika's pool. This just feels like you have to drink either water or something super flavorful out of it or it'll be revoked. So after 27 years, I finally own it and can put on my shelf with my favorite wrestling glasses: A WWF New York pint glass and the foreign exclusive Demolition juice glass! Do I truly plan on using it like I've used the others? Well, yeah. I like to get some use out of my collectibles and this is no different. Of course, it won't get used every week, but you can certainly expect me to fill it with something tasty while I sit back and eat wings while watching the Royal Rumble next week!